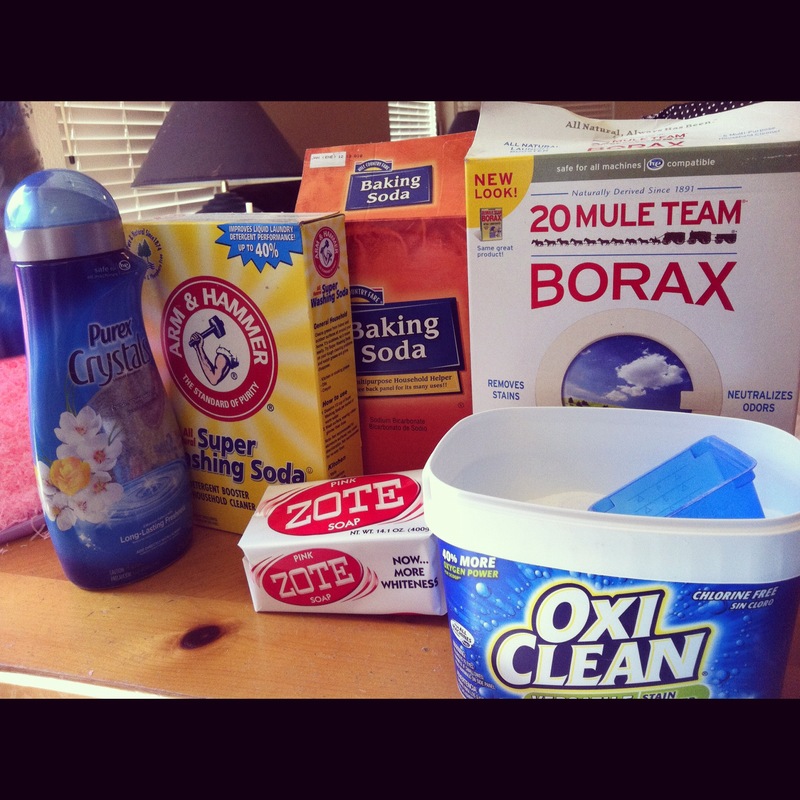 Thanks to Pinterest I found a recipe for homemade laundry detergent. You can find the details on the site How Does She? Because the recipe makes a lot of soap I was worried about making it on my own, because if I don’t like it then I’m stuck with a whole lotta soap. I recruited some friends to join me in the endeavor, that way we share the cost of the experiment and we all get to try it without having to commit to a large bucketful of detergent. 1 (3 lb) Container of OxyClean- Found in the detergent aisle. 2 (14.1 oz) Bars of Zote Soap- Supposedly found in the detergent isle, but I had to go to Home Depot to find mine. These are the ingredients, although we used two bottles of Purex Crystals and two bars of Zote soap, we forgot to take an ingredient picture so we threw everything back on the table. The Zote has to be grated in order to mix it with the rest of the powders. We took turns grating it, which was another bonus to making this with friends. It makes a pretty pink curly snow. We alternated each ingredient into the bucket to make sure it was fully mixed. Patsy is not afraid to get right into anything she’s doing, those are her hands mixing up the soaps. 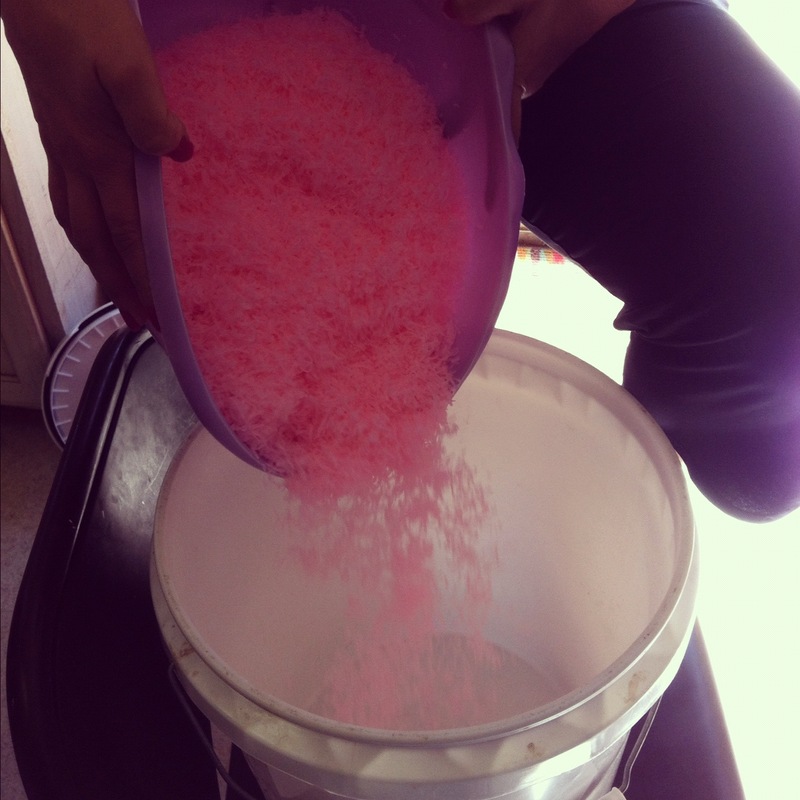 We mixed it in a five gallon bucket and then evenly split up the detergent from there. According to the website, only 1 to 2 tablespoons are needed per load. We’ve already done a load of jeans and towels in our house. The jeans look clean and smell good, but the towels are stiffer than I like so I may continue to use dryer sheets. I am going to try to do more laundry tomorrow because the jury is still out for me, but if I do decide to use it then it should save us a few dollars a month. With three kids every bit of savings helps! This entry was posted in Instagram, Project 366, recipes and tagged detergent, homemade, Instagram, pinterest, project 366, Purex, soap, zote. Bookmark the permalink.